The American Women’s Hospitals and the Fire of Smyrna: "Millions of refugees, almost totally without men" | Doctor or Doctress? The American Women’s Hospitals and the Fire of Smyrna: "Millions of refugees, almost totally without men"
This story focuses on the humanitarian relief work of the American Women's Hospitals during the refugee crisis of the Greco-Turkish War in the aftermath of World War I. AWH members gave radio addresses and published appeals to US audiences describing the devastation they witnessed to raise funds for their work. These documents and photographs may serve as a window into the ground-level effects of the geopolitical clashes in the wake of the First World War. Students may also use the sources to study the conditions on the ground and the international response and draw comparisons to what they can see from present-day humanitarian crises. Have students take on the role of an AWH doctor writing a fundraising appeal for their work that will be published in a hometown paper. Use evidence from the sources to describe the conditions in the refugee camps and what the AWH is doing to meet their needs. Have students create a fundraising brochure for the AWH's work to address the refugee crisis. The brochure should include photographs with captions, a summary of the conditions on Macronissi, and an outline of the AWH's plan to address the needs of the people there. After their brochure is done, students may write a process paper discussing their reasoning for what images and information they chose to include. The conditions faced by the people affected. What obstacles do they face? Are their needs being met? How are they coping with the devastation? The humanitarian aid organizations involved. How are aid organizations working to meet the needs of the people in crisis? What obstacles do they run into in their work? International reaction to the crisis. How has the international community reacted to this crisis? What strategies have organizations used to raise awareness? Have they been effective? Each group should find recent and reputable sources that address these questions. As they answer them, they may evaluate how the answers compare to the refugee crisis in Greece and the AWH's work to address it. What methods for raising awareness do these sources show that the AWH used during this crisis? How do they compare to the methods aid organizations use today? Are today's methods more effective? 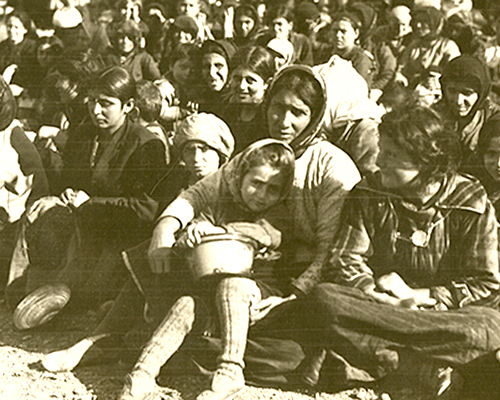 How did the AWH try to foster empathy for the refugees in American audiences? Do you think these efforts were successful? What effects has our growing ability to communicate instantly over long distances had on our reaction to humanitarian crises like these? Clip from The Twenties in Colour. "Middle East: The Birth of Nations." British Broadcasting Corporation. 15 November 2007. Accessed 2/2/2018. This documentary provides some historical context for the fire of Smyrna and the Greco-Turkish War and describes its effects on the population there. This digital exhibit offers a broader view of US efforts to address the crisis in Greece and Turkey. In addition to information on US fundraising efforts and aid work for the Near East Relief organization, this site also provides some helpful context for the complex geopolitical causes of this crisis. "Picture Perfect: Teaching Analysis Skills with Fundraising Photography." Elliott Earle. Blog post. 27 July 2016. The Legacy Center Archives and Special Collections at Drexel University College of Medicine. Accessed 2/2/2018. Essay on applying text-based primary source analysis skills to photography in the classroom. The images captured in this story, along with other American Women's Hospitals fundraising photography, may be used to raise questions of the intent and perspective of the "author" behind the camera. The history of both the burning of Smyrna and the Greco-Turkish War are still the subject of contentious debate. Students conducting research on these events should be directed to consider the biases in the primary and secondary sources they use.